View from Section 26 is a collection of off-the-wall stories along with an irreverent look at the characters behind them that make minor-league hockey unique. Featured is the IHL's Manitoba Moose, a team that slogged through a dreary, yet oddly entertaining existence playing in front of pitifully small, comatose crowds at the Winnipeg Arena. 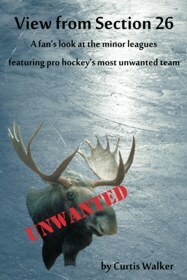 For more on the Moose and the book, please click here.